The lure of a paperless office has been around for decades. But the technology is finally here. And ecommerce businesses are uniquely suited to go completely paperless — receipts, invoices, newsletters and much more are electronic documents already. Ditch the paper-based filing system with tangible cabinets, shelves, storage facilities filled with documents, folders, stacks of papers and go completely digital with searchable PDFs, storage clouds, e-faxing and more. There are many benefits to eliminating paper in your business. A paperless filing system takes up far less space and makes for faster retrieval of data in your files and sharing of that data electronically. And it’s an effective way to go green; less paper used is presumably better for the environment. Here are the basic building blocks and issues to be mindful of when considering going paperless. Banking. For banking and credit cards, have all accounting statements emailed to you digitally, if possible. Most national banks and credit card companies — including Bank of America, Wells Fargo and Citibank — will allow an opt-out of paper statements and instead offer an email statement or simply the ability to login to your secure account online to monitor and pay off balances. 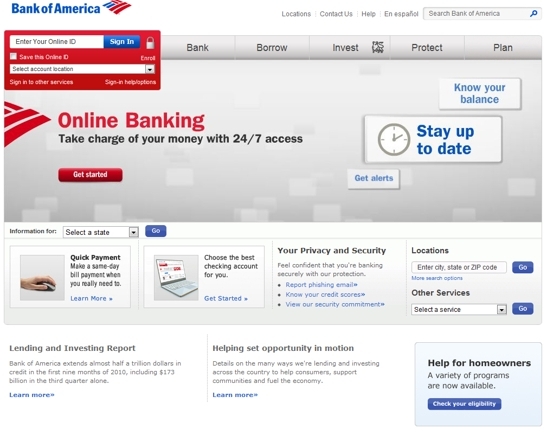 Bank of America home page. For example, Bank of America offers several paperless solutions to its business clients. Most major banks offer this solution, but for this example we’ll take a look at Bank of America’s paperless option. Log in to your Bank of America online account. Go the “Accounts” tab and then click the “Account Details” sub-tab at the top of the window. Click the “Go Paperless Today” button. Agree to any of the online statement terms, save your changes and you’re done. This will stop all paper statements from being physically mailed to you. Again, taking Bank of America as an example, it also offers a free and handy mobile banking app. You can transfer money, locate ATMs, pay bills and check balances from this app. Check it out for iPhone, Android, and BlackBerry. Shipping. Many of the major shipping services like FedEx and UPS have an option for fully electronic and automated invoicing, accounting and billing options. Set up email notifications for your customers and for yourself so everyone gets digital receipts and shipping documents. Ideally, the only paper you’ll have to generate is the shipping label for your package. Find more information about paperless solutions for businesses at FedEx.com and UPS.com. Scanning and Searchable PDFs. When paper comes into the office, scan it and shred it. It’s not quite as simple as it sounds. The type of scanning is the crucial element here. Scanning paper documents and turning them into PDFs is the most common thing to do, but a simple PDF filed away in a digital folder instead of a paper folder is just as difficult to search out and extract data from in an efficient manor. So, the key here is to create searchable PDF files. Searchable PDF files are similar to normal PDF files with the exception that you can search out any text in them. This includes PDF files that have been created from original hand-written notes, typed documents or any other printed file that was not originally digital. Using optical character recognition software (OCR) these scanners can convert just about anything into a searchable and editable file. This way you can use your digital file system as your very own searchable database, searching out keywords, names or any other word or phrase that can help you track down that file you need. To create searchable PDF files yourself, you can buy a scanner that generates searchable PDFs. A popular model is the Fujitsu ScanSnap S1300 that is compatible for both Mac and PC. It is small enough to travel with and scans about 8 pages per minute. It features one-button “Searchable PDF” creation. Fujitsu also makes larger models like the fi-6010N and S1500M with similar features. Both of these handle between 20-25 pages per minute, but have different compatibility requirements. 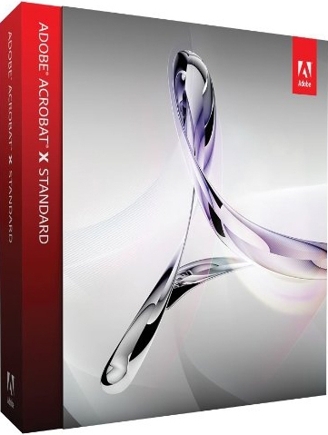 Adobe Acrobat. If you already own a scanner and don’t want to buy another, you can also create searchable PDFs using highly-rated OCR software like ABBYY Finereader or Adobe Acrobat software. Simply scan your document and save it as a PDF. Then use your OCR software to convert that file, or any other existing PDF files, into a searchable PDF. Document Conversion Companies. Scanning paper documents by hand, even with a high-speed scanner that creates searchable PDFs, would be a full-time job and could take months or years to complete. If manual document scanning is not a realistic option for your company, there are several document conversion solutions available like Tab Service Company, Document Conversion Associates, or microMedia Imaging Systems that will convert any of your paper files into Searchable PDFs using some brand of OCR software. They’ll send you your old paper documents back as digital files on DVD, CD, hard drive or flash drive. Many of these services also provide secure hosted storage solutions for these new digital files. You can download your files from their servers or leave copies as a backup. Decentralizing your documents from computers or servers in your office can be a useful tool in the digital office. If your power goes down or there is an emergency, you can still access those files on the document conversion company’s hosted server. Digital Document Management. Once you’ve created your digital files, you need a way to quickly and reliably search for the data in those digital documents. There are many document management solutions — including HP Managed Enterprise Solutions, M-Files, FileHold or Microsoft’s SharePoint — to share and search out these digital files. Many of these services will allow for restricted access and other security-oriented features for documents that contain sensitive information. Storage Space. With all these digital files that you’ve created, you need to think about storage. Luckily, computer hard drives are low-cost, and creating your own digital file cabinet is within reach even for small businesses with limited resources. You can simply buy a computer, install some extra hard drives and you’ve got yourself a smalltime server that you could store all of your digital files on. For companies with more resources, get a server with the necessary amount of hard drive space to store your files. When you need more space, buy and install more hard drives. There are many storage server options from Intel to Dell. For files that are kept for record keeping and backup purposes — and that don’t need to be accessed often — transfer them to DVD, external hard drive or try the cloud based secure storage solutions from companies like Rackspace.com, Box.net, Windows Live Mesh or Dropbox. For varying monthly fees, you can have access to virtually as large of a digital storage space as your company needs. Electronic Fax Machine. Why take up more space in your office with a fax machine when you can send and receive faxes online? With an Internet connection, a scanner, printer and an email account, tools that you likely already have in your office, you can fax without an additional office appliance. 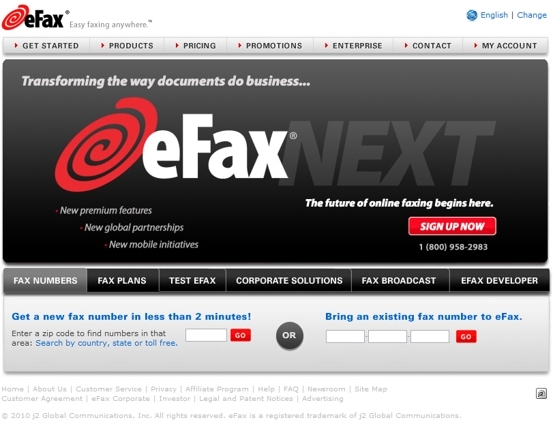 Set up an account with one of the several electronic fax services like eFax, Send2Fax or myfax and you can send and receive faxes, digitally. QuickBooks 2010 Helps Merchants "Go Paperless"